Deep within the hot, noisy, grimy centre of Manila, in the district of Quiapo, stands one of the most remarkable nineteenth-century churches anywhere. It’s not a place that many tourists reach, though it’s not far from Manila’s old walled town, Intramuros. The Basílica Menor de San Sebastián, or San Sebastian Church in English, is fabricated entirely of steel: its exterior is unmistakably metallic because it looks like a cardboard wedding cake; the interior is a scholarly and innovative essay in pure Gothic Revival, designed by a Spanish architect, Genaro Palacios, then the director of public works in Manila, and fabricated by a Belgian company, the Societe anonyme des Enterprises de Travaux Publiques, which sent over fifty tons of castings to be erected by local labour. San Sebastian Church was intended as a permanent replacement for the last of a succession of earlier churches, the first in timber, the others in brick, that had succumbed to fire or earthquake since 1651. Its priest, Esteban Martínez, was a member of the Order of the Augustinian Recollects, a contemplative order that had played a major part in evangelising the Philippine islands from the seventeenth century onwards. He was determined that the new church should be fire-resistant and earthquake-proof. Before construction began it was designated as a Minor Basilica by Pope Leo XIII and it was completed, from first column to consecration, within a year in 1890-1. Inside, the steel looks like stone, most of the surfaces painted gloomy grey with faded images of saints. The proportions are authentically European Gothic: indeed, the only real giveaway is that the piers are square in section with rounded corners. The transepts don’t protrude from the aisles, and the crossing between the transepts is lit by a vaulted octagonal tower very like Ely Cathedral. The interior is light and airy because there are plenty of stained-glass windows, and the great steel doors at the west end and each transept are left open, so the nave chandeliers sway gently in the breeze. As often in Catholic countries, a constant stream of people came in to pray and go again. There’s no evidence, and indeed little likelihood, that Gustave Eiffel was involved in its design. Perhaps his name has attached to the building by association, like the Martinique buildings of Pierre-Henri Picq (1833-1911) – or the numerous late-seventeenth century English buildings that were once hopefully ascribed to Inigo Jones. As an island of calm in the bustle of the city, it is a welcoming place. This entry was posted in Life-enhancing experiences, Sacred Places, Victorian Architecture on May 29, 2017 by Mike Higginbottom. The successor to the Tokyo Tower, transmitting digital broadcasting signals and other communications across the region, is the Tokyo Skytree, which, at 634 metres, is almost twice the size of its predecessor. It claims to be the tallest tower in the world, and the second-tallest structure, after the 830-metre Burj Khalifa in Dubai. Its design is both practical and elegant. The footprint is an equilateral triangle, surrounding the central core, and the external lattice transitions gradually to a cylinder at around 350 metres. There are two public observatories at 350 and 450 metres. It was built 2008-2012 on the site of the Tobu Railway’s Narihirabashi Station, now renamed Tokyo Skytree Station, four miles north-east of Tokyo’s central station. The railway company is a major investor in the tower and the commercial development around its base. In a location prone to earthquakes the Skytree is seismic proofed, with a suite of devices including the same sort of tuned mass damper that stabilises the CityCorp Center in New York City. Its colouring is carefully chosen: it is painted a special blue-white, and is lit sky blue and purple on alternate nights. The Tokyo Tower and the Toyko Skytree represent the best and most beautiful solutions to the same problem, a generation apart. And now the city has two landmark high towers. This entry was posted in Life-enhancing experiences on May 23, 2017 by Mike Higginbottom. When Gustave Eiffel received criticism over the appearance of his 1889 tower in Paris, he simply replied that he’d done the maths and the shape required to withstand the physical forces bearing on the structure was also the best aesthetic solution to the design. Indeed, the shape has proved impossible to improve. The canny Lancashire proprietors of the half-size version in Blackpool built a three-storey entertainment complex around the legs, with a circus at its base. Sir Edward Watkin, the British railway magnate, began an abortive giant version next to the Metropolitan Railway at Wembley, where the stadium was later built. Over thirty replicas – some closer to the original than others – have been built: https://en.wikipedia.org/wiki/Eiffel_Tower_replicas_and_derivatives. Of all these tributes to Eiffel’s design, there is no more sincere example of flattery than the Tokyo Tower, built in 1958, at a time of recovery from the devastation of war, to provide broadcasting transmitters for radio and television. At 333 metres, it was for long the tallest structure in Japan, and exceeds the height of the Paris tower by precisely thirteen metres. At the base is a visitor-reception building, FootTown, which is not integrated into the structure as in Blackpool. It’s possible to ascend to two observatories, at 150 and 250 metres respectively. Indeed, those who wish can climb 660 steps to the first observatory by a staircase from the roof of FootTown. The Tokyo Tower is not tall enough to provide full digital coverage across the region, but it will continue to carry FM transmitters and act as a limited digital back-up, and its status as a landmark and a tourist attraction seems secure. This entry was posted in Life-enhancing experiences on May 17, 2017 by Mike Higginbottom. Every citizen of the USA, unless they are a Native American, is by definition the descendant of immigrants. Something approaching 40% of the current population of the United States can claim ancestry from immigrants who entered through Ellis Island between 1892 and 1954, arriving under the gaze of the Statue of Liberty. 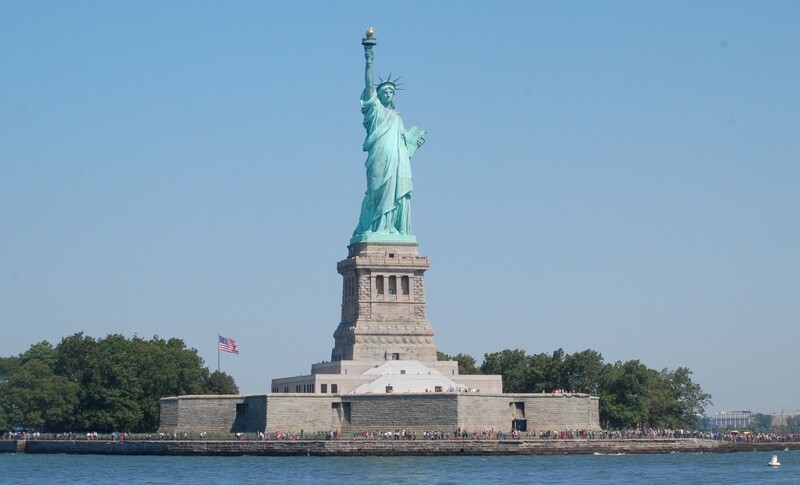 ‘Liberty Enlightening the World’ is the full title of the great copper colossus, perhaps the most famous of all the visual symbols of the city and the nation, designed by the French sculptor Frédéric Auguste Bartholdi (1834-1904). The statue was financed by the voluntary subscription of the French people at a cost of $250,000 “to commemorate the alliance of the two nations in achieving the independence of the United States of America”. It would be an irrevocable disgrace to New York City and the American Republic to have France send us this splendid gift without our having provided even so much as a landing place for it. It is ironic that even the Statue of Liberty had problems securing a landing here. The famous figure of a robed woman, stepping forward bearing a flaming torch in her right hand, is formed of copper sheets 3/32 of an inch thick. 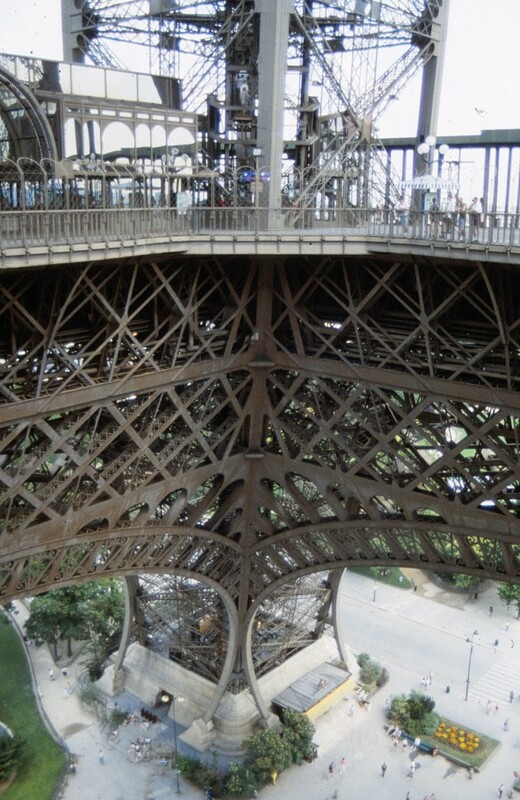 The suggestion to use this material, shaped by repoussé hammering, came from the architect Eugène Viollet le Duc, and the problem of supporting it was resolved by the engineer Gustave Eiffel who designed the framework and armature on which the copper sheets are mounted with sufficient flexibility to absorb changes in temperature and the effects of wind. Fabrication initially took place in Paris, where it gradually dominated the streets surrounding Bartholdi’s studio, after which it was dismantled and shipped across in 214 large crates. The location in New York Harbour, formerly known as Bedloe’s Island, was chosen by Bartholdi. The structure stands on the foundation of the former Fort Wood, in the shape of an eleven-pointed star: the stone pedestal is itself 89 feet high, and the torch of the statue rises to 151 feet above ground-level. The statue’s size, though it looks insignificant across the distance of the Harbour, is prodigious – the eyes are each two feet wide, and the right arm and torch, which were displayed as a separate unit at the Centennial exhibition at Philadelphia in 1876, are 42 feet high. This magnificently flamboyant project came to final fruition in 1886, when the completed structure was dedicated by President Cleveland. The word ‘iconic’ is heavily overused, yet ‘Liberty Enlightening the World’ is an icon, to everyone from the protesters in Tiananmen Square to Kate Winslet’s character, Rose, in the 1997 film Titanic, as it might be to the property developer and TV show presenter, descended from German and Scottish immigrants, who became the 45th President. This entry was posted in Exploring New York City, Victorian Architecture on May 11, 2017 by Mike Higginbottom. The Eiffel Tower, like the London Eye, was intended to have a limited life. The most memorable creation of the prolific engineer Gustave Eiffel (1832-1923) was devised as the centrepiece of the 1889 Exposition Universelle, marking the centenary of the start of the French Revolution. Eiffel was not at first interested in the proposal of its initiators, his colleagues Maurice Koechlin and Émile Nouguier. He rose to the challenge because his experience of working with wrought iron in structural engineering made him the pre-eminent specialist in his field: no contemporary could have accomplished so elegant a solution. Eiffel had made his name as a bridge-builder – in particular for the magnificent Maria Pia Bridge (1876-7, 353 metres high) in Portugal, and the Garabit Viaduct, (1882-5, 565 metres high), in the French Massif Central. Both are higher than the Eiffel Tower, which was ultimately 324 metres high, and both consist of an elegant arch which supports piers carrying the deck. The Tower’s appearance challenged the traditionalists – Guy de Maupassant took to eating in its restaurant, declaring it was the only place in Paris where he couldn’t see it – but Eiffel insisted its daring design had its own aesthetic, “Do not the laws of natural forces always conform to the secret laws of harmony?”. More importantly, Eiffel intended it to be useful for scientific experiments, some of which he carried out from a private apartment at the top. After the exhibition and his subsequent withdrawal from engineering work, he conducted experiments in aerodynamics, set up a meteorological station and encouraged its use as a communications tower. When Eiffel’s licence to operate the tower ran out in 1909 the City of Paris intended to dismantle it, but its value as a mast in the early days of wireless telegraphy, later known as radio, along with its status as an emblem ensured its survival. It proved almost immediately useful in the First World War to jam the radio signals of the German army advancing on France. In the Second World War French partisans made sure it was practically useless to the Nazis by cutting the lift-cables. It is still used as the primary transmitter of digital radio and TV in the Paris region, and is the most visited paid monument in the world. More than 650 million visitors have taken the vertiginous ride to at least one of the three levels. This entry was posted in Life-enhancing experiences, Victorian Architecture on May 5, 2017 by Mike Higginbottom.